Let me set the scene with a statement of fact: until this year, I had spent considerably less time fishing than I have, say, living in Kathmandu. I have never been to Kathmandu. But life's funny like that - you think you've got all your regular leisure activity ducks in a row, and then your mate calls from Finland and says, "Have you ever fly fished?" Not being the sort of person to turn down an opportunity to drink whisky, and do "man" things (which is what I understood fishing to be), I packed my newly acquired waterproofs into my battered old backpack, and headed north to Oulanka National Park on the border of Finnish Lapland, and only a stone's throw from Russia. This is prime outdoor country, with vast skies, crystal rivers, dense forests and very sparse population. In the summer months, fishing here is religion - and fly fishing the high church. 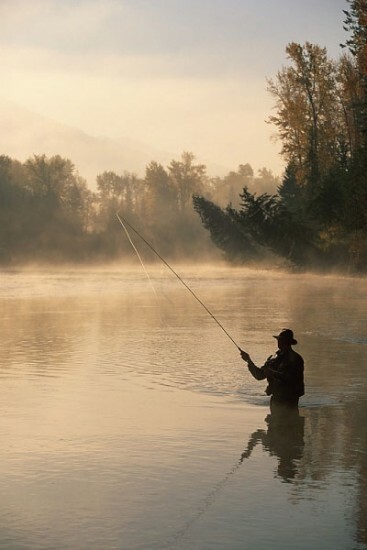 The lakes and rivers abound with Greiling, Trout (Brown) and Salmon, amongst others, and it was thus that the scene was set for my introduction to this most timeless of pursuits. Our river of choice was the Kitka, flowing from the west towards the Russian border, and our starting point the village of Kayla. Much of the Kitka river is virtually unreachable on foot (unless you're Bear Grylls), so, with our raft fully equipped, my path to enlightenment began with a hard paddle to our first fishing spot, a secluded and shallow gravel section on the Upper Kitka about 4km from our starting point. I should point out, at this stage, that we were accompanied by two Finnish chaps who could fly fish before they could walk, and who were adorned with the paraphernalia of true aficionados - whisky flasks, fishing jackets and the most exquisitely personally-tied flies. I should also point out that Ben, my mate (who came to fly fishing some years ago and has never looked back) had made two de facto statements regarding my forthcoming experience: firstly, that I would find spiritual peace in these surroundings unlike any I had found before, and secondly that I was guaranteed to catch something. Now, as I stood thigh deep in m'waders, Greys in hand, I have to say the first statement was not a hard sell - the serenity was palpable, with bright, clear skies, the soft trickle sounds of the river flowing by, not another soul in sight, and not an artificial noise or smell assaulting the senses. The second I found harder to believe; it's no secret that fly fishing is difficult and frustrating, and that therein lies part of its beauty and its intricacy. So I had m'doubts. But then, with the grace of a willow in a gentle breeze, I cast my first line, and watched as the gold nymph flashed in the sun and settled like a deft parachutist about 20yards upstream. Now, it's not to say that I got it right first time every time, but the fluidity of movement, the grace and rhythm took hold of me, rather than the other way around, and before I knew it, all that Ben had said materialised. Hours passed, the soft swish of the line coursed through the air, and in those moments I began to truly understand why people will go to the ends of the earth to do what I was doing. It turned out that Ben was right on both counts - within a few minutes of my first cast I had hooked a Grayling, playing with it for about five minutes, slowly reeling it in and relishing the interaction, only to feel even more satisfied by releasing it back into the river. I had started with wet flies, trying this and that to see if I could snare a Trout, with no immediate effect, but Grayling prevailed, and by the end of our first morning's fishing I had caught and released eight of these brown-silver fish. There are strict limits on fish sizes in Oulanka, with 35cm for Grayling, and 45cm - 60cm for Trout depending on whether you fish the Upper Kitka, or Lower Kitka, which was where we were headed for our overnight stop. The Kitka has class 1-4 rapids, with the biggest falls being at the Jyrävä waterfall where the river transitions from Upper to Lower. As we navigated our way expertly downstream (Ben and Sami, one of the Finns, are both qualified rafting guides), it became more and more impossible to contemplate the outside world. As we neared twilight, we stopped for a last fish, and then settled into our Laavu (a wooden lean-to), lit a fire, brewed some coffee and reminisced about the day's fishing. Aki (the other Finn) and Sami both had veritable success, catching over thirty fish between them, and, as darkness fell, the animated conversation about the ones that got away became ever more ridiculous as the Bushmills took hold. The following morning, I had my first dry fly experience further down the river. I seemed to have lost none of the previous day's finesse, and to this day I will never forget seeing the flash of my first Brown Trout as it breached through the crystal surface of the river, took my fly and ran straight to the riverbed in its opening gambit against being caught. Like warrior and beast we fought, this way and that, until, at last, vanquished, the brave fish relented, and I reeled him in. As I netted him, and contemplated whether he was big enough to keep (we decided against it), the final piece of this marvellous puzzle slotted into place - I had found my calling: this immeasurably beautiful occupation had snared its next lucky victim - and like the Trout and Grayling, I was truly and thoroughly hooked. By the evening we had reached the Russian border, and the beauty of the river receded as real life faded back in. But those fish are still there, and the river continues to carve its path to the East. Joseph D. Farris once said, "When a man picks up a fly rod for the first time, he may not know, he has been born again." He must have known I was coming. 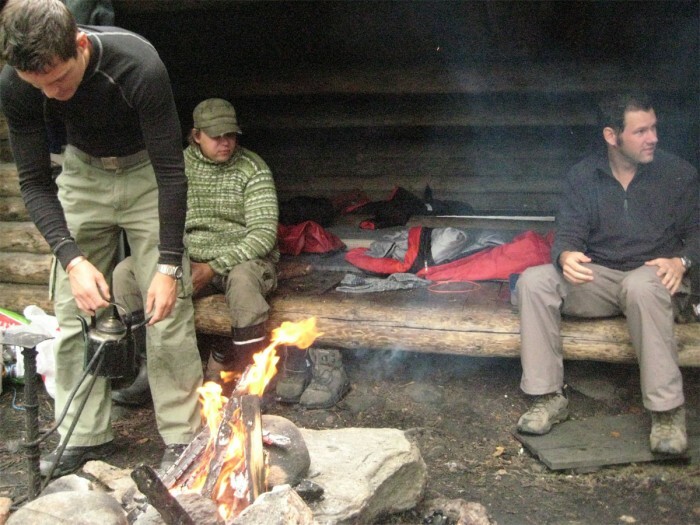 In picture: The art of fly fishing, and camping at the Laavu - getting back to nature. These guys are legends, slightly crazy, completely qualified in rafting, climbing and fishing, and will show you a great time. Fly: Helsinki to Oulu (where the FEF guys will collect you), or fly to Helsinki to Kuusamo (closer but more expensive).